I always love learning about foods from other cultures, so with St. Patrick's Day around the corner, I had to explore Corned Beef Hash! 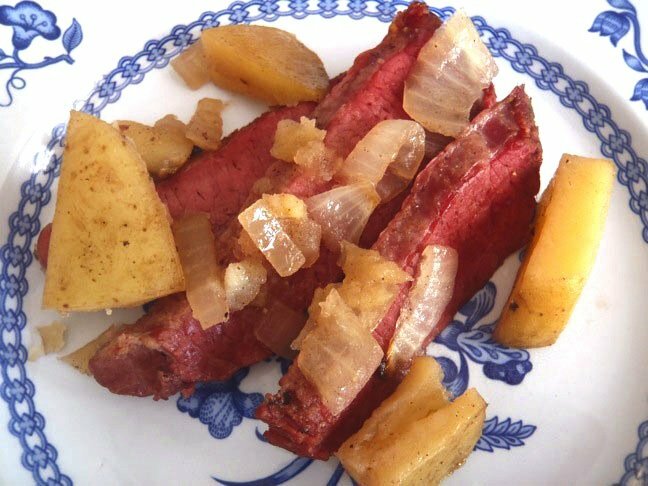 In the U.S. and Canada, corned beef is usually associated with Saint Patrick's Day, but I learned that corned beef is not considered an Irish national dish at all! The connection with Saint Patrick's Day specifically originates as part of Irish-American culture. Corned beef is brisket that gets its awesome flavor from a brine it marinates in, sometimes for weeks. 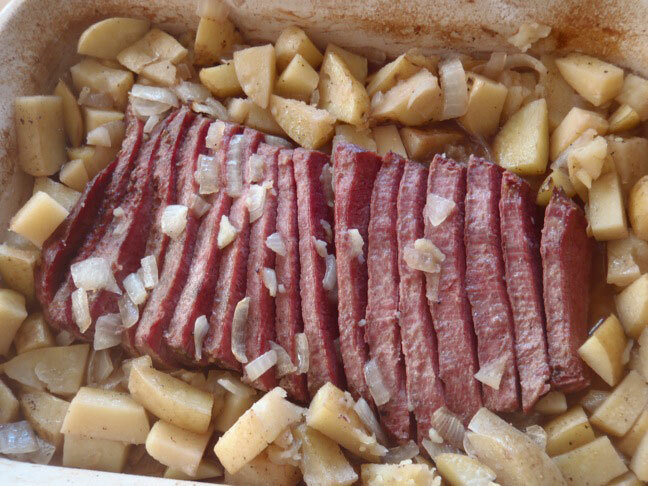 So unless you want to start this process a few weeks before St. Patrick's Day, I suggest you buy a brined, corned beef. Most markets will have them available, especially this time of year. I was thrilled by this flavor-packed dish — a comfort food for sure . . . and even more delicious when served with my St. Patrick's Day Cabbage and Cherries! A perfect meal to celebrate this fun holiday! 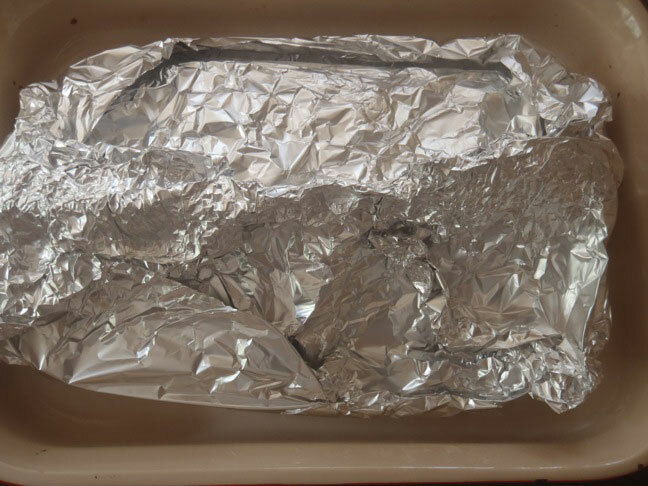 Wrap and seal the foil tightly around the brisket, leaving room for air. (Leave a couple inches room around the meat, at least.) Place in the preheated oven for 6 hours. Then let it cool to room temperature and place in the refrigerator overnight. Preheat the oven to 375 degrees and remove the corned beef from the refrigerator. Use the back of a knife to scrape all of the fat and spices off and discard them. Leave all the juices in the dish and set it aside. Place the meat on a cutting board and cut it into thin (about 1/4-inch) slices — against the grain! Return the sliced meat to the center of the baking dish. 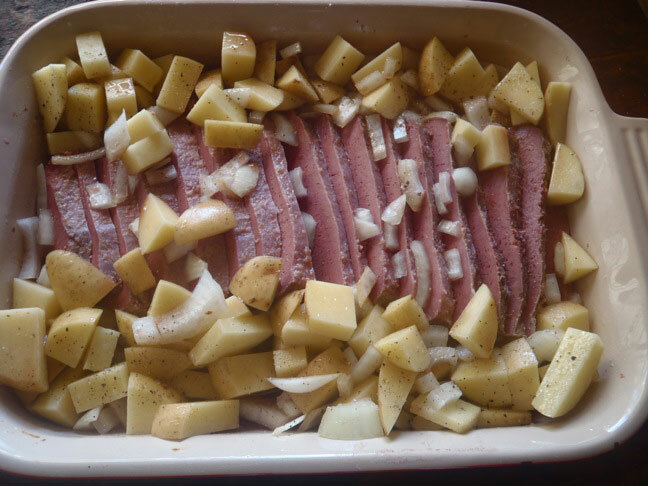 Place the potatoes and onions all around the meat slices and toss all three with olive oil, salt and pepper. Mix the wine with the broth and then pour it evenly over the meat and potatoes. Place in the oven until the potatoes are tender and beginning to brown, about 40 minutes. 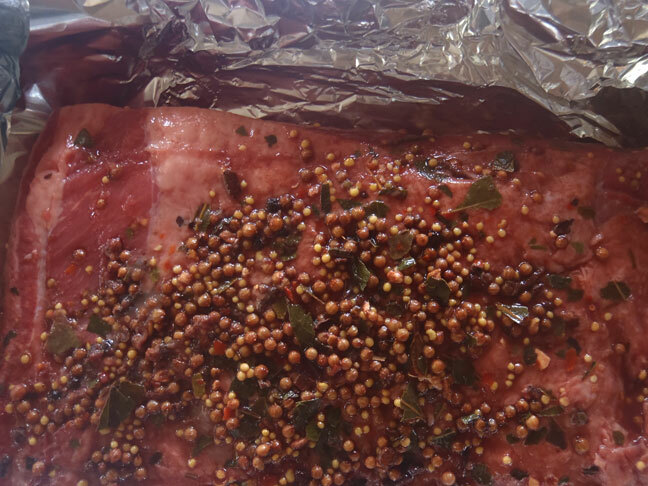 Corned beef brines vary, but here are some ingredients you might find in any given one: cinnamon, mustard seeds, bay leaves, allspice, dill seeds, cloves, ginger, peppercorns, coriander, juniper berries, mace, and cardamom, salt, and water.